Even yummier than the kind you get at the fair! 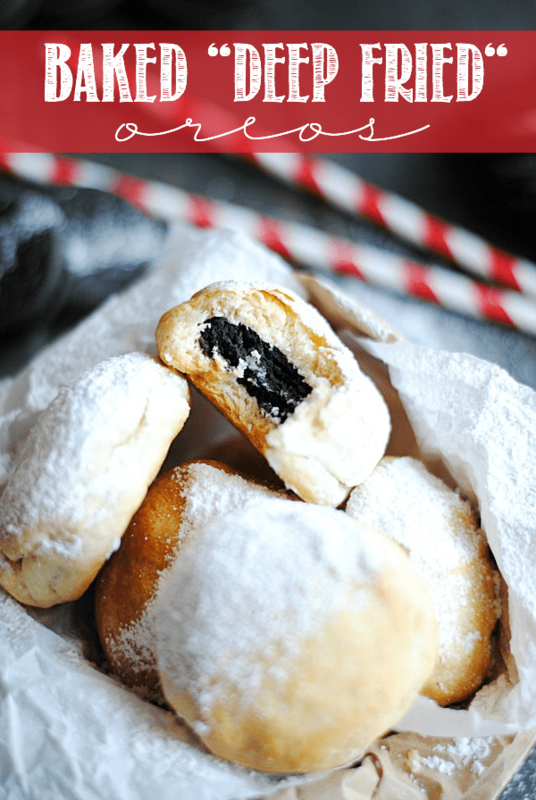 Plus, these Baked “Deep Fried” Oreos are SO easy to make. And clean up is a breeze! Note: this recipe was originally published in 2014. At heart, I am the most major fried-food junkie you’ve ever met. And I absolutely mean m-a-j-o-r. I do what I can to keep the beast under control on a day-to-day basis. But the siren call of french fries, chicken fingers, and warm donuts hits hard. And sometimes you just have to give it what it wants. Reason #1 being: it’s pretty mess-free. And on a gotta-have-fried-food-day, odds are you don’t have the energy to clean up a fried-food mess in your kitchen, anyway. So that’s good news. There’s no oil t contend with, no deep fryers or pots on the stove to clean, and no paper towels all over the kitchen to absorb the oily aftermath. Win-win-win. Reason #2 is: that these totally hit the spot. When you need something soft and warm and buttery golden delicious that just melts right in your mouth– these do that. And if you even need another reason to make these, here it is: think about how much LESS BAD these are for you than the ones you get at the fair! I mean… yes. It’s still pastry wrapped around an Oreo doused in powdered sugar. But: you can always use reduced fat crescents and Oreos, not to mention the fact that you’re not tossing these babies into a hot oil bath! I’m going to call that a healthful improvement, mmmkay? Oh, and did I mention you only need 4 simple ingredients? And I betcha already have them on hand too. All you need to make these is one can of Pillsbury crescent roll dough, Oreos (any flavor! ), a little bit of milk, and powdered sugar. You’ll be giving the Oreos a quick dunk (to soften them a little), wrapping them in crescent roll dough, and baking them right up. See? SO simple! 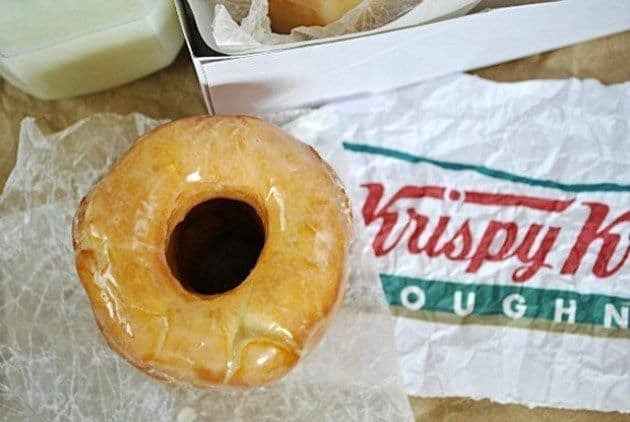 You can buy either the perforated crescent dough or the one solid sheet, either way– don’t unroll it when you take it out of the can. Slice the dough like you see I’ve done above. It’s okay if the dough gets a little smushed while you’re slicing. You’ll be smushing it later anyway into Oreo-sized circles. These are really their VERY best served right out of the oven. They’ll be okay later on, but never as good as they are warm. Just like fried food– you want to eat it fresh! If you want to prepare them ahead of time, that’s fine. But don’t bake until you’re ready to serve (they won’t take long). 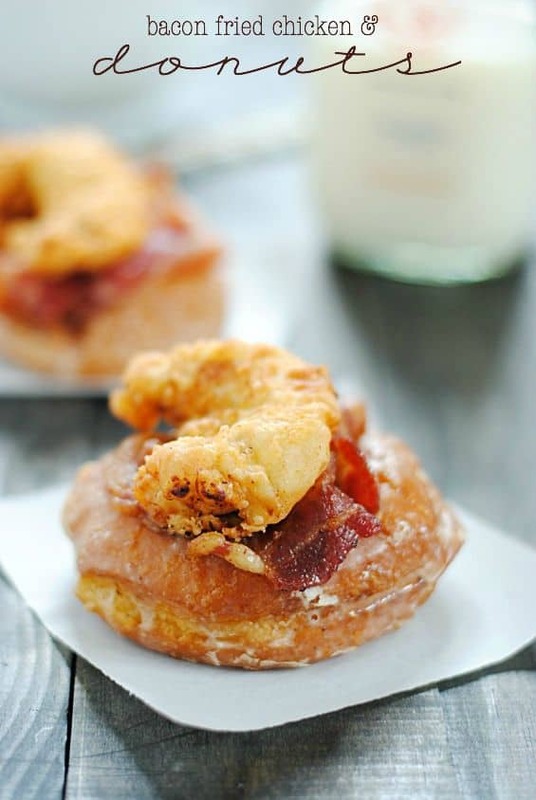 These would also be INCREDIBLE if you opted for a powdered sugar glaze instead of a dusting. 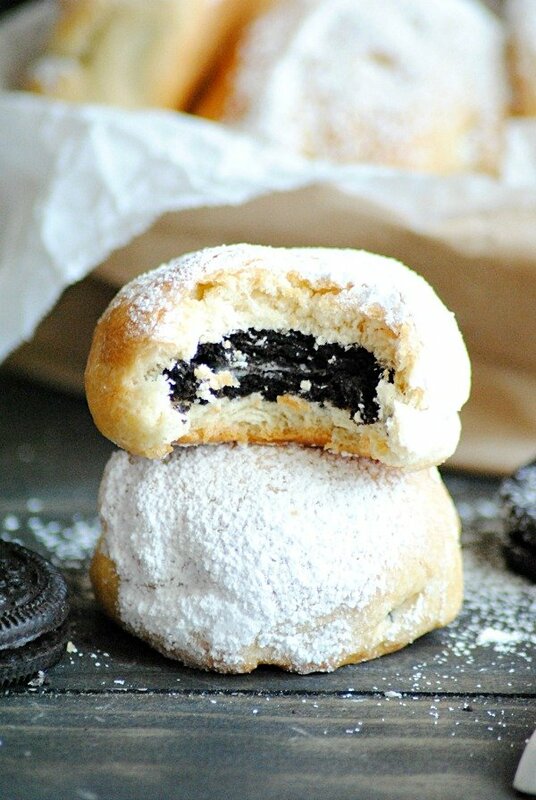 Imagine a Deep-Fried-Oreo-DONUT. Yummmmmmmmm. You could also add a stick if you really wanted to give them more of a fair-food-feel. Just pop the stick inside the Oreo cookie before you wrap it in the dough. Easy peasy. Even yummier than the kind you get at the fair! 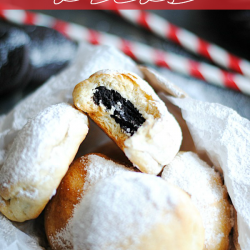 Plus, these Baked "Deep Fried" Oreos are SO easy to make. And clean up is a breeze! 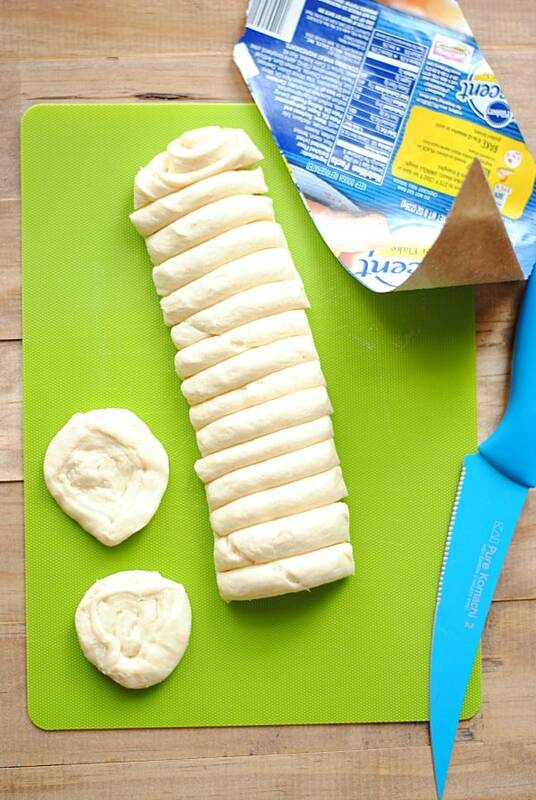 Slice the cylinder of crescent roll dough into 16 pieces (see photo in post). "Smush" each piece into a circle slightly bigger than an Oreo. Dunk an Oreo in the milk (very quickly-- you don't want it to be soggy!) and place on a crescent roll circle. Press another circle of dough on top of it, and pinch the layers together to seal the Oreo inside. Repeat with each Oreo. Place Oreos on a lined baking sheet, and bake for 10-12 minutes until golden brown. 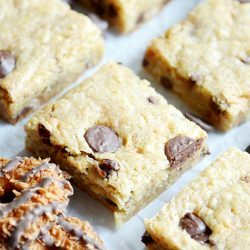 Remove from oven and immediately dust with powdered sugar and serve! I’ve always said Cresent Rolls are one of the most versatile and useful foods out there…boy, this recipe sure proves that :) I need this, now! This is so ingenious! I cannot believe you found a baked alternative to deep fried oreos-and it looks incredible! Can’t even handle this level of brilliance. I NEED THESE. I’ve never had a deep fried Oreo before, although I’m always hearing about them! Better late than never, right? You’re a genius. Really. This is…just fantastic! Oh my word. I am dying. This is brilliant! Oh my, I’m going to have to try this, I love fried yummies but have a fear of the oil and stuff. Plus, Oreo-stuffed things are awesome. Yup you are a genius! I want to smuggle these into the State Fair so that I can feel less guilty and not eat their fried Oreos, which yeah. Not so healthy! These are truly inspired. Love it! Ashton, I’m going to have to ask you to stop coming up with such fabulous stuff. 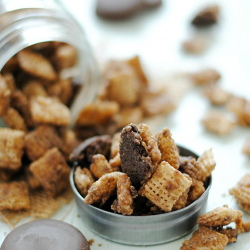 I think you’ll need a cooking Oscar for these and your chunky brownies. Please. Stop. My daughter goes crazy for the state fair “deep fried” version, I can’t wait to make these, Much more healthy and affordable. 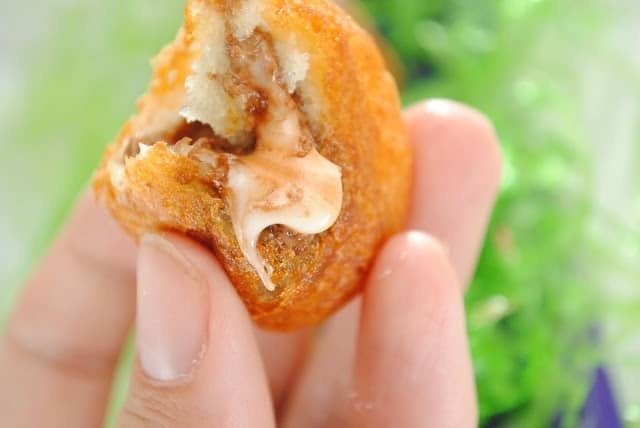 Wow I don’t think anything could taste better than a deep fried oreo.. definitely craving a bite of one right now. They look wickedly delicious. Yum! 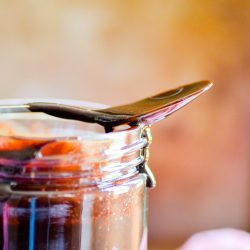 I’m lovin’ your recipe blog! Oh, my word! This is seriously awesome!!! I totally think these are the healthified version of deep fried. Plus, ain’t nobody go time for frying and cleaning…not to mention the oil smell that lasts for days! And I totally want these on a stick…so fun!!! !